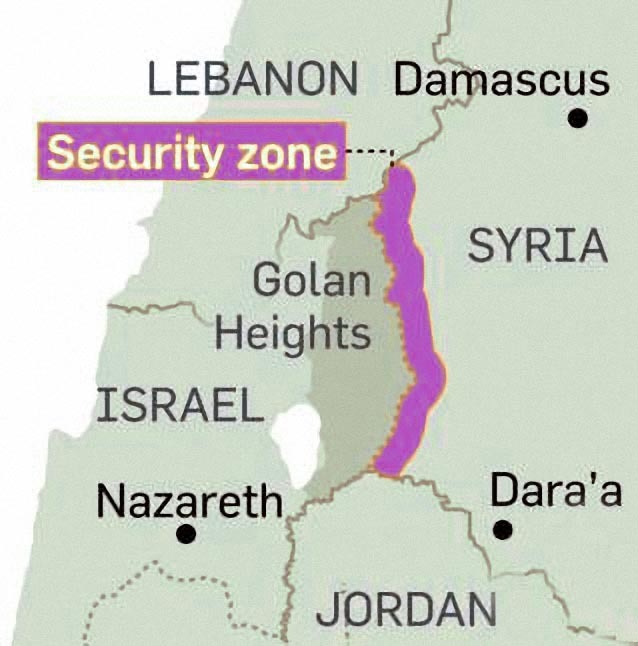 ISRAEL considers to set up a buffer zone reaching up to 16 kilometers (10 miles) inside Syria to protect itself from fundamentalist rebels on the Syrian side of the border. The proposal, which has been drawn up by the military and presented to prime minister Benjamin Netanyahu, is intended to secure the 76-kilometer border against a growing Islamist threat if the Syrian government loses control of the area. The buffer would be modeled on the Lebanese security zone, in which the Israeli defense forces patrolled jointly with the South Lebanon army, a militia, up to 26 kilometers inside Lebanon from 1985 to 2000. It would, in the initial stage, include two Israeli infantry brigades and a tank battalion based at outposts in Syrian territory. “We’ve presented the prime minister with a comprehensive plan to defend Israel’s border after, or perhaps before, the fall of Assad’s regime,” said a source close to the military planners. In recent months jihadist groups such as the Nusra Front, which Washington regards as a terrorist organization linked to al-Qaeda, are reported to have infiltrated several border villages. Two of the villages, Breika and Bir Ajam, are less than a mile from the Israeli border. Benjamin Netanyahu, who visited Israeli outposts overlooking the rebel villages last month, watched construction workers erect a 20ft steel wall along the border to replace a rickety fence. Israel claimed already in November that Syrian rebels had taken control of most of the villages near the ceasefire line of the Golan Heights. There are also several reports that the FSA (free Syrian Army) is allowed to roam freely in the Golan heights and that it has a stable supply line via Israel. Interesting… any credible source confirming this information? AFP reported it on Sunday, citing unnamed Israeli military sources. Sounds pretty speculative… Not that it’s impossible, but there’s no way to verify this information. This is of course hearsay, I was not there and I repeat only the information from various sources. But it is not more speculative that the reports of alleged atrocities by the Syrian army or the government militias, which are reported in all mainstream media outlets without ever questioning the seriousness of the sources.